Amidst the wind singing the glory of nature as it swayed over the meandering cheerful river, prayers flags, those tattered and torn danced to the song of wind. Their fluttering often shook the old wooden pole on which they were hoisted. Yet, merry was all over the hill. Faraway, the basking yellow ray is disappearing behind the white peaks, and Chorten, in its miserable ruin was weeping silently. Only a commanding wind made the weeping of old Chorten noisier, however. “But people still come and worship you. What’s bothering you with that sadness?” in a roaring wind, one of the swaying prayer flags comforted his old compatriot. The wind has now ushered the strong cold hail storms. Prayer flags shivered strongly as the shredded cloth pieces fluttered even stronger. “I have had the opportunities in my life to know many of your predecessors,” Chorten now felt the pain of prayer flags as well, “Once pompous and colorful ancestors of yours withstood even stronger winds than this. They were always singing something or the other, only when there was a strong sunshine, they felt alone as people stayed inside the house. There were no soul to circumambulate”. “I was built over a place where a great lama once subdued the deity. I have ever since tried my every bit of self indulgence to repay the faith of the great lama and the villagers by peacefully blending with the landscape”. Every little thing that exists on the earth is vulnerable to the change and succumbs sadly to the new urge of ours. History is lost in a change and we let it be. 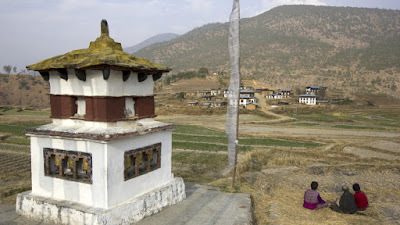 Our biggest strength lies in your cultural identity and these chortens form a bigger part of our cultural landscapes. It forms the image of our place and reminds us of our religion.